Did you know the Musto Loddington Jacket is named after the estate where the Allerton Project is based? Incase you are unfamiliar, the Allerton Project was founded after the deaths of Lord and Lady Allerton who bought and refurbished Loddington Hall in 1934. Both Lord and Lady Allerton were keen shooting enthusiasts and provided for the Allerton Research and Educational Trust (Allerton Project) to be set up after their deaths. The aims of the Allerton Project are to research and educate people in different farming methods and the effects on the enviroment and wildlife, i.e the potential benefit of game managment on farmland and the wider enviroment. The Game & Wildlife Trust became a partner of the Allerton Project as it was an ideal chance to bring together under one project aspects of game management developed in several other projects. 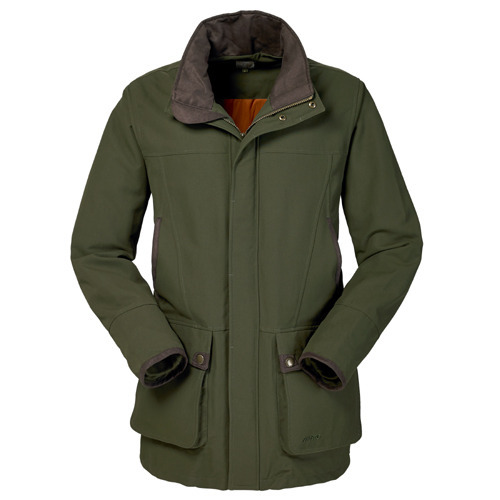 For each Musto Loddington Jacket sold, Musto make a contribution to the Game & Wildlife Trust.. The Musto Loddington Jacket is not only a fantastic shooting jacket but supports a good cause too! With a Gore-Tex® Z-drop liner the Musto Loddington Mens Jacket is made for the outdoors. Waterproof, windproof and breathable to Musto's exacting MPX standards it offers maximum weather protection. The durable water repellent coating encourages water to bead and run naturally off the jacket surface. The light insulating wadding throughout the mens jacket adds a layer of warmth on colder days without the jacket being too heavy. Features on the Loddington Jacket are designed for recreational shooting: - with retainer flaps to hold the cartridge pockets open for ease of use, concealed studs within the stormflap to avoid stock damage and a removable two-way adjustable peaked storm hood providing additional weather protection. Other features include elasticated inner cuffs, hand warming pockets with a fleece lining, a zipped security pocket and a contrasting trim and collar.